Little Common Football Club is set to begin the second half of its league programme with a four-point lead at the top of the table. 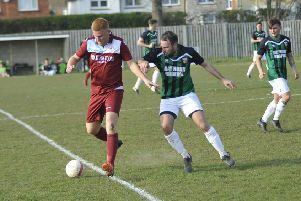 The Commoners doubled their advantage at the Macron Store Southern Combination League Division One summit last weekend when they won 2-1 at home to third-placed Langney Wanderers and second-placed Wick drew at Steyning Town. Player-manager Russell Eldridge said: “We’ve got to be pleased with the way the season’s gone and everyone that’s contributed to the group has been excellent. “It’s been a real team effort. There’s been different teams for different games, but whoever’s played has contributed to where we are. A couple of negatives have been the two defeats, but to be where we are, we’ve got to be happy with ourselves. Common have won 14 and drawn one of their first 17 league fixtures. They’ve scored more goals than anybody else in the division and no team has conceded fewer, so their +40 goal difference is the division’s best. Next up for Common today (Saturday) is a trip to the Withdean Stadium to face a 13th-placed AFC Varndeanians side which they beat 5-0 in August’s reverse fixture. “I think they’ve improved since we played them at the beginning of the season so I’m expecting a different game,” continued Eldridge. Charlie Bachellier is suspended following his red card against Langney Wanderers last weekend, but Common are otherwise likely to field a similar squad. Little Common’s remaining 2017 fixtures (subject to change): December 2 AFC Varndeanians (a), December 9 Mile Oak (h), December 23 St Francis Rangers (a), December 26 Bexhill United (h), December 30 Hailsham Town (a). Southern Combination League Division One top half (played-points): 1 LITTLE COMMON 17-43 (+40 goal difference), 2 Wick 17-39 (+33), 3 Langney Wanderers 16-37 (+32), 4 Lingfield 17-35 (+29), 5 Mile Oak 16-29 (+6), 6 BEXHILL UNITED 17-28 (+18), 7 Steyning Town 16-25 (+14), 8 Ringmer 17-24 (+10), 9 Seaford Town 16-24 (-3).